Der Artikel Barocke Bass-Kantaten aus Mitteldeutschland (Mügeln-Archiv) wurde in den Warenkorb gelegt. 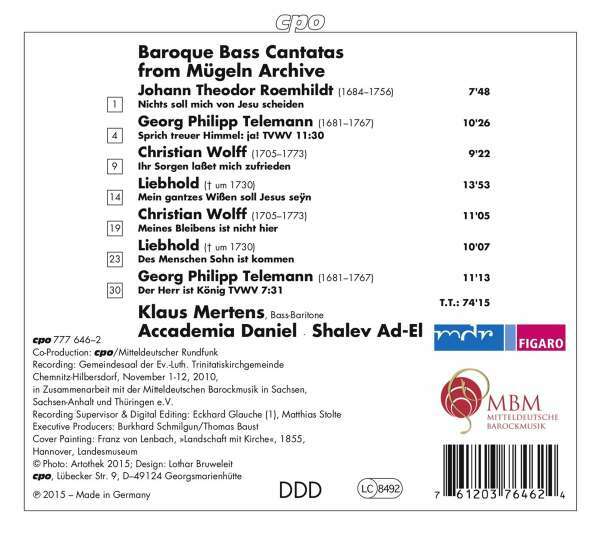 This new CD featuring the bass baritone Klaus Mertens and the Accademia Daniel under the conductor Shalev Ad-El offers a representative sampling of baroque bass cantatas from St. John's Kantorei Archive, which was established in the small town of Mügeln in Saxony in 1571. The Mügeln Archive today houses numerous printed editions of music and manuscripts from the sixteenth and seventeenth centuries as well as more than four hundred cantatas extant in manuscript form. The cantatas presented here are from the first half of the eighteenth century and were copied during the tenure of the music director Daniel Jacob Springsguth. All the composers of the cantatas were from the regions of Saxony and Thuringia. 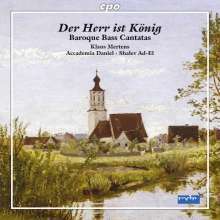 The breadth of the program on this CD makes a significant contribution to the cantata repertoire and demonstrates that even minor masters operating in the countryside could compose on a very high level. Klaus Mertens once again confirms »his outstanding position among German singers of Early Music with his tonally beautiful renderings and clear articulation« (klassik-heute). Hörprobe Track 4: Arie: Sprich treuer Himmel, ja! Arie: Sprich treuer Himmel, ja! Hörprobe Track 8: Arie: Höchster Gott, erfülle dies! Arie: Höchster Gott, erfülle dies! Hörprobe Track 22: Rezitativ Accompagnato - Arioso: Ach wäre doch mein Abschies vor der Thür! Rezitativ Accompagnato - Arioso: Ach wäre doch mein Abschies vor der Thür!